Several New Hampshire Republicans surveyed Friday said they think the recent revelation that GOP presidential hopeful Ben Carson never applied to the U.S. Military Academy at West Point could hurt his candidacy. According to Politico, this contradicts details of the candidate's upbringing as outlined in two books he wrote. The revelation comes as others have questioned Carson's accounts of his youth, including his story about almost stabbing a friend when he was a teenager. It also comes a day after Carson's statement that Egypt's great pyramids were built by the Biblical figure Joseph to store grain. "Not a good sign," Dennis Brady of Exeter said of the West Point revelation. "I graduated from the Coast Guard Academy. This was a major milestone. Can't see how Carson could have accidentally misspoken." Republican operative Tom Rath of Concord said he is already committed to John Kasich, but said he thinks Friday's news could impact Carson's campaign - especially if there is more to come. "His campaign needs to get control of the stories," he said. "They must do a painful but complete introspection of the candidate, his story, and what - if anything else - is yet to come. At this point, they'd better understand that anything that might come out will come out. They can afford no more surprises." Peter Hansen of Amherst said he was considering voting for Carson before Friday, but that has changed "somewhat" based on the latest news. Former state legislator Pamela Price of Nashua said she wasn't going to vote for Carson anyway, but she thinks this will impact his candidacy. "He should step aside," she said. Zakariah Johnson of Portsmouth echoed that thought. "I hope that Ben Carson will drop out," he said. "I doubly hope he will never hold elected office. Unfortunately, if the polls are to be believed, the majority of voters no longer consider sanity or competence to be prerequisites for having access to The Button. Scary." Still others said they don't think the Politico story is a deal. "This is peanuts compared to what a candidate has done who is running for Prez on the Dem side," Amherst Republican Bill Modis said, referencing Hillary Clinton. Jeffrey Levitan of Laconia said Carson is one of four candidates he is considering voting for. He said he doesn't believe the Politico story, and thinks Carson is telling the truth. 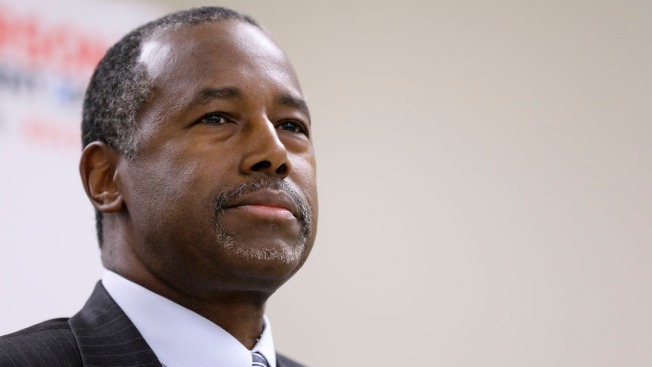 "The Democrats are very nervous about Carson as the Republican nominee," he said. "I wouldn't put it past the Democrats or Mr. Trump to stir up these lies." Exeter's Frank Ferraro said Carson is in his top three, and Friday's news won't change that. "Hillary Clinton lied to the families of those who died in Benghazi and to the American people, and yet the press says nothing about it. Why then should anyone care about an embellishment of where a candidate may have been able to go to college." The most recent poll of New Hampshire Republicans, released by WBUR this week, had Carson in second place in the Granite State, just 2 percentage points behind Trump. Carson's next scheduled visit to the state is on Nov. 20, when he is expected to officially file his candidacy for the New Hampshire primary.